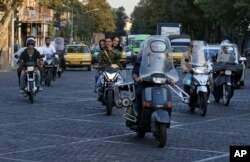 Pedestrians and motorcycles share a road in downtown Tehran, Iran, Oct. 8, 2017. Trump is set to deliver a speech on Iran this week in which he is expected to decline to certify Iran's compliance in the landmark 2015 agreement, referring it to Congress, and perhaps targeting the country's paramilitary Revolutionary Guard with new sanctions. In the streets of the Iranian capital on Monday, The Associated Press spoke to a series of people about the nuclear deal: students and teachers, young and old, men in fashionable clothes and women in chadors. Nearly all had the same concerns: Benefits from the 2015 accord have yet to reach Iran's 80 million people despite its government signing billion-dollar airplane deals. Inflation remains high, job opportunities stay low. People ride motorcycles in downtown Tehran, Iran, Oct. 8, 2017. They also said Trump's threats fall in line with what Iranian leaders since the 1979 Islamic Revolution have warned: Americans can't be trusted. That feeling has unified hard-liners supporting Iran's clerically overseen government, as well as reformists seeking to change it. "I have not seen any benefit from the deal, so what is Trump going to add to nothing?" asked Gholamreza Haeri, a 21-year-old architecture student. "Is he going to add zero to zero?" The faith of the average Iranian has eroded over time in the nuclear deal, which saw Iran agree to limit its enrichment of uranium in exchange for the lifting of economic sanctions. It was sealed in July 2015 after 18 months of negotiations by the five permanent members of the U.N. Security Council — the U.S., Britain, China, France and Russia — as well as Germany. In September 2015, a telephone survey by the Toronto-based opinion research firm IranPoll for the University of Maryland found 45 percent of 1,000 Iranians said they were not confident the U.S. would live up to its obligations in the nuclear deal. By September 2017, an IranPoll telephone survey of 700 urban Iranians found 77 percent were not confident. The margins of error for the polls were 3.1 percentage points and 3.7 percentage points respectively. "The trend has continuously been increasing," said Amir Farmanesh, the president and CEO of IranPoll. That suspicion extended to Tehran's streets Monday. 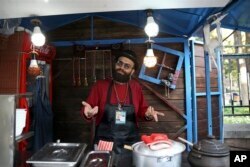 Ashkan Ashtari, a 30-year-old electronics importer, speaks during an interview with The Associated Press at a street food market, in downtown Tehran, Iran, Oct. 8, 2017. Bahram Safari, a 39-year-old junior high school teacher, said he initially supported the nuclear deal but slowly became disenchanted by Trump's constant attacks. Safari pointed to comments by Supreme Leader Ayatollah Ali Khamenei, who repeatedly called the Americans untrustworthy during the negotiations. "During the nuclear talks, I was wondering why the supreme leader was saying so, now I understand that he was right," Safari said. "Americans are not loyal to their signatures." Ashkan Ashtari, a 30-year-old electronics importer, said breaching the deal will be problematic for both sides. "Iranians are worried about a breach of the nuclear deal because Iran has kept with all of its commitments and has been loyal to the agreement," he said. "Chances are that the U.S. president will break his country's commitment, as he has done so before." For Iranians, they still do not have access to international credit cards. While Iranian banks have reconnected to the SWIFT network, which allows for international wire transfers, many complain they still don't have access to global financial markets. "I know that under the deal, Western banks were supposed to enter Iranian market, but they have not come in practice," said 31-year-old Zohreh Lavasani, who works at a private bank. "So I do not expect the new move by Trump can lead to a meaningful change." Iran's stock market dropped 1.2 percent in the last week as the price of hard currencies like dollars and euros edged up against the Iranian rial. 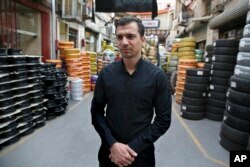 Mehdi Abedi, a 30-year-old tire dealer, said despite the challenges, Iran could handle facing more U.S. sanctions. Mehdi Abedi, a 30-year-old tire dealer, speaks at a market, in downtown Tehran, Iran, Oct. 8, 2017. "The world community is not just America. Iran can still continue its dealings with other countries," he said. "We have been at odds with the United States for about 40 years now and have managed to survive despite conflicts." Also on Monday, Gen. Mohammad Ali Jafari, the top commander of the Revolutionary Guard, said in a statement that Iranian officials will have a "unified" approach toward the U.S. threats, the official IRNA news agency reported. "Rest assured Mr. Trump that we [the Guard], foreign ministry and administration are united and our hearts are synchronized," the report quoted Jafari as saying. Hassan Aghaei, a 23-year-old street food vendor, speaks in downtown Tehran, Iran, Oct. 8, 2017. Some people continue to hold out hope for the nuclear deal. On Sunday, the German Embassy in Tehran put a placard on its wall saying: "Yes to Barjam" — nuclear deal in Farsi. Germany was involved in negotiating the agreement. "I still want the deal to remain in place and both sides remain faithful to it so that we can finally see its positive impact on the lives of the people," said Hassan Aghaei, a 23-year-old street food vendor. But some saw fault in both sides. "Iran's actions have probably provoked America, such as testing missiles and similar things," said Mehdi Shakeri, 42, who imports and sells car parts. "Iran could have dealt with Trump more cautiously because he is a radical leader and many of his actions are not always based on logic. Perhaps if Iran had not made Trump sensitive toward itself, we would not be in the situation we are today."